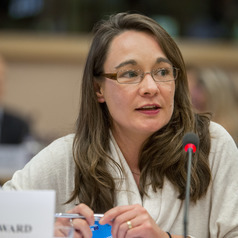 Katy Hayward is Reader in Sociology and Senior Research Fellow at the Senator George J. Mitchell Institute for Global Peace, Security and Justice at Queen's University Belfast. She has 20 years’ research experience on the impact of the EU on border conflicts and cross-border cooperation, most particularly on the Irish border. This includes research as part of the EU FP5-funded EUBorderConf [EU & border conflicts] project, the RCUK-funded TRUST [Tracing Risk and Uncertainty in Security Technology], and the current Canadian SSHRC-funded ‘Borders in Globalization’ programme. She has presented widely on the topic of Brexit and Northern Ireland/Ireland, and has given evidence on this before parliamentary committees in both the UK and the Republic of Ireland.